KARACHI: Sindhi Cultural Day was celebrated throughout Sindh on Sunday, with great enthusiasm and fervour. 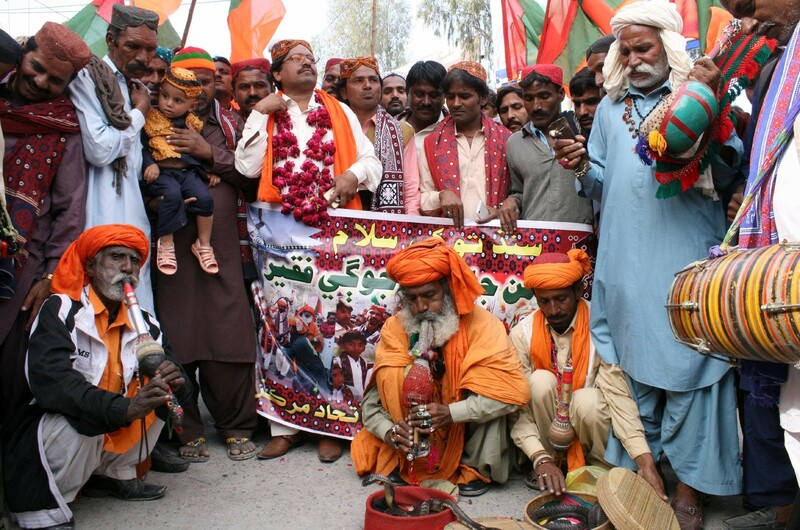 Rallies and colourful programmes were held in different cities to highlight the rich centuries-old Sindhi culture. In Karachi, a vibrant programme was held outside Karachi Press Club and was attended by a large number of people. Members of different political parties, including Jeay Sindh Qaumi Mahaz, Sindh United Party, Pakistan People’s Party and Pakistan Tehrik-i-Insaf, took out rallies from different parts of the city and reached the press club. The participants were clad in the traditional Sindhi topi and ajrak, and sang and danced to traditional Sindhi tunes. The Muttahida Qaumi Movement also organised a program to celebrate the day in PIB Colony, in which the participants wore ajrak and Sindhi cap to celebrate the culture of Sindh and its soil. In Sukkur, Jeay Sindh Qaumi Mahaz, Sindh United Party and other social groups took out rallies. They marched through various roads and danced on the tunes of cultural songs. Women and children also took part in the rallies. The main function was held outside the local press club. In Nawabshah, various rallies were taken out to mark the day. The women and children participated in the rallies. The participants sang songs and danced to the tunes of folk songs. They vowed to preserve the culture of Sindh at all costs. In Ghotki and Naushahro Feroze, Jeay Sindh Qaumi Mahaz staged rallies to celebrate the day with enthusiasm. Rallies were also staged in Kashmore district. Sindhi Cultural Day is widely celebrated with traditional enthusiasm to highlight the centuries-old rich culture of Sindh. The day is celebrated all over Sindh, and among Sindhi people living around the world. Sindhi people celebrate this day to demonstrate the peaceful identity of Sindhi culture and attract the attention of the world towards the rich heritage and culture of Sindh. On this occasion, people gather in all major cities of Sindh at press clubs and other places, arranging poetry circles, ‘mach kachehri’ (gathering around a circle with fire on sticks in the centre) musical concerts, seminars, lectures and rallies, while people, as well as the major hallmarks of cities and towns, are adorned in Sindhi ajrak. The festival also symbolises and commemorates the ancient Indus Valley Civilisation. Sindhi Culture Day is celebrated all over the world on the first Sunday of December every year.